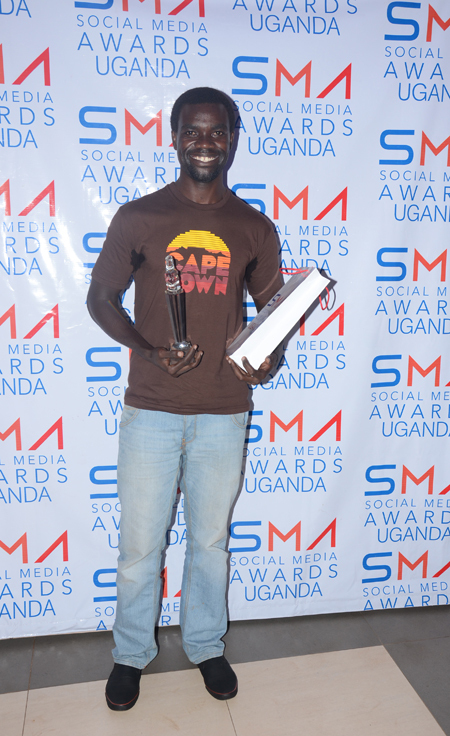 The inaugural Social Media awards took place last Friday night at The Hub, Oasis mall, in Kampala. It was not only a night of fun and recognizing the people putting this country on the world’s social media map, but also a moment to know the faces behind the hilarious and informative tweets and blogs we so enjoy. This was not the kind of event where guests talked to each other. If you had anything to say, all you had to do was post it online. It was an evening spent talking in social media jargon such as hash tags, timelines, pings and pokes (do people still do that?) Basically, everyone was busy on their gadgets. The Uganda Social Media Awards (SMAs) is Uganda’s first event that seeks to bring together individuals and organizations that are at the frontline when it comes to using social media for entertainment, change, sharing ideas, creating communities and talking to customers online. The awards seek to reward individuals and organizations making an effort to harness the power of social media to engage and build communities online. The SMAs are a brainchild of Seanice Kacungira and sister Nancy Kacungira, plus the whole team at Blu Flamingo, which bankrolled the event. MTN, Air Uganda, Samsung and The Hub were also sponsors. The Observer’s photojournalist, Edward Echwalu, was recognized for using his photography online on his blog; http://echwaluphotography.wordpress.com to tell the Ugandan and African story. Echwalu was also first runner-up at the CNN-MultiChoice Africa Journalists Awards 2012/13 in the photography category. The big winners of the night included: Moses Serugo who won the Entertainment Writers’ category, Anne Kansiime – who trounced the likes of Navio, Bebe Cool and Maurice Kirya in the Celebrity Category – and 40 Days Over 40 Smiles an NGO that helps disadvantaged children. The night’s entertainment was courtesy of the dancing duo of Rozmerie & Viccy plus The Cape Brothers whose acapella performance of Naava’s Aliba W’ani and Bruno Mars’ Just the Way You Are displayed vocal prowess. The emcee, Roy Tumwizire, an old boy of Namasagali College, was also the man to watch; the brother can sing, dance and speak eloquently at the same time.